I can't quite work out what has changed in the formula, for 2/3 of its life Dwc has performed around break even apart from the most recent third. 1) If you are passive investing in $DWC, that is precisely what it is not intended for. 2) The post linked above and others in the LABS category on the blog should help explain the rationale for $DWC and when it makes sense to consider investing in it. DWC is more suited to people interested in trading darwins. So from this understanding, as we are at a low point, now would be a good time to hold until we reach the break even? And precisely not the time to sell. As DWC behaves cyclically, meaning it should perform pretty consistently over time..? Can someone tells me how DWC and DWF can distribute perf fees when they make new time lows. Believe it or not, our community seems to know how to trade those DARWINS. I prefer to give my opinion under DWC , because DWF is still too young. Is it possible to make money buying something that goes southward since one year? Yes but it means taking high risks to make small profits. 9k of collected fees aren't so much for a committed AUM of 1-2 millions. If communityhedge is losing it means that community is winning. Maybe times are mature to provide something that takes advantege of winners not of losers. The core concetpt is that DWC hedge the positions of traders with low LA and it is true that noob wannabe-traders don't use stops and lose on the long run. The problem is the we have also many good traders with long stops that beat the market on the long run. The other problem is that I don't believe the there is 1MM on DWC "to hedge portfolios risk". Investors are clearly averaging down hoping a retracement and this significant AUM would be better invested on many good growing darwins. You are one of the best traders here and you are an algo trader like me so probably you examined thousands of return charts. What do you think about the behaviour of DWC in the last 3M ? In my mind, just a simple discro trader, Darwinex should be an EXCHANGE AND STOP LABS !!! A second quarter with no comment ! 1- Darwinex proves that their Exchange (asset manager aka darwins) is good and can become great. 2- Darwinex proves that their Labs and Quants (DWC, DWF) are bad and can not become investissable. I have never been a fan of DWC but I prefer not to be so negative and keep a lower tone speaking about something that required hundreds of hours of work and research. It seems that you have half of your savings on DWC or DWF . Euh!!! I take a major tone cause i want that Darwinex becomes a leader (broker and darwins) but the Labs (investissable DWx) draws them downwards. Lol, precisely ! Work hundreds of hours = the pay of Quants = Expenditure for somethings (dwex, dwc, dwf) which do not work ! Sorry but i am anxious time that the leaders (Colon bro) will put to understand that their Quants employees are not efficient (in charge of Dwex, dwc, dwf). I will have liked the opposite and to see their darwins (Dwex, dwc, dwf, dw....) turning over the positive one but there it is each time the opposite, a disappointment then a concern. Ok but it is their money and their time and I respect it despite the results. And it is not the end of the world. We are here to give suggestions not commands. What would be nice is an update on the behaviour/results. I evaluate and revise my strategies every six months, now we have more than one year of live trackrecord for DWC (that is also the main engine for DWF) . 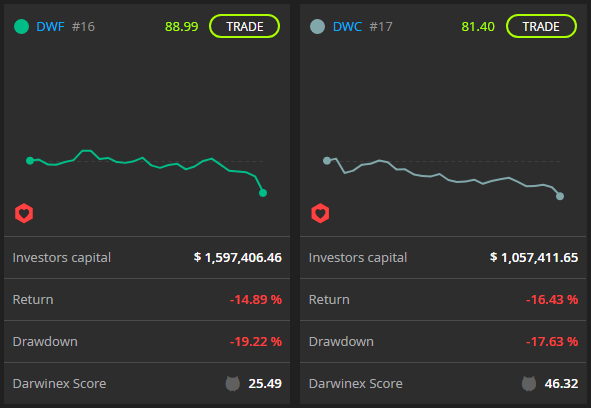 DWC and DWF should hedge other Darwins so they should be profitable when others have Drawdowns. I can’t confirm that. My portfolio had new DD every day in the last 5 days and only on 1 day I saw profit on DWC, which is a 20% match of the goal. There are 559 darwins with Loss Aversion lower than 4 . You could build a demo portfolio with 559 darwins and see if it is hedged by DWC, good luck! I don’t want to prove whether there’s a fault in the algos, maybe they should weight the Darwins in another way , maybe it’s fine, I don’t know. What I know it’s unusable for me, even for intraday trading. The proofs ! All is simple, if you can not win when you invest, all the time, you must change. Here, we discuss on the real time sentiment index. For me, iit is the total opposite lol. Not security. A quarter is the wrong time frame, it’s made for short term trading and it’s not a long term Investment. But also there it doesn’t work for me, and I have really doubts that all other investors made the big money which we should believe if these two Darwins suffer permanently. I agree, this is the reason why I posted the chart with 1 year . One year track record is catastrophic ! Not invest in BUY & HOLD mode ! Shame for investors. If they must wait a drawdown for invest, sell when appears a litlle up. It's not smart. Designed to be traded ? A joke ! The one proof, and it's darwinex who say it: The low D-score ! !